North End Pharmacy- Located at 240 Merrimac St by Towle. Pharmacists Nicholas and his son Andy Kafalas along with Nicholas’s wife. When his parents retired and passed on he continued the Pharmacy into the early 80’s. Eaton’s Drug Store – 58 State St.
Daniel L. Lynch Pharmacy – 173 High St Newburyport, Ma. Haydn’s Rexall Drug – Located at 14 Pleasant St.
Hersey’s Pharmacy – 19 Story Ave. The pharmacy was located next to the Port Bowling Lanes. Sunder’s Drug Store – Located at the corner of Lime St and Purchase St. This entry was posted on Sunday, April 13th, 2008 and is filed under Drug Stores. You can follow any responses to this entry through the RSS 2.0 feed. You can leave a response, or trackback from your own site. Sunders drug store on the corner of Lime and Purchase… They had a soda fountain and sold comic books. there was Rexalls on the corner of State and Pleasant Street ..not sure it was called by another name or not..
Was it Lynch Pharmacy on the corner? Eaton’s Drug Store was on the corner of State and Pleasant. Small soda fountain (Believe it or not..). Haydn’s Rexal on the corner of Pleasant and Inn Sts. Also had a soda fountain. Saunders was the only South End drug Store. I’m glad you remember North End Pharmacy! My uncle Nick was a great guy, and my family and I used to visit him, Anne, and Andy often. These days, when I’m in town, I usually spend some time in the park down by the river, behind where the drugstore used to be. It’s a great spot! Dan Lynch’s drug store was across from Eatons on Essex & State st. It was destroyed in one of NBPT’s most memorable fires along with Hymes shoe store. A huge fire in the winter of 55 (I think). Dan then moved up to High St by the train overpass. The fire started about 7:00 AM and raged all morning. The temps were single to teens and the fire trucks were frozen in place. Firewall were what saved the rest of State st. I watched it while sitting in Eatons across the street. 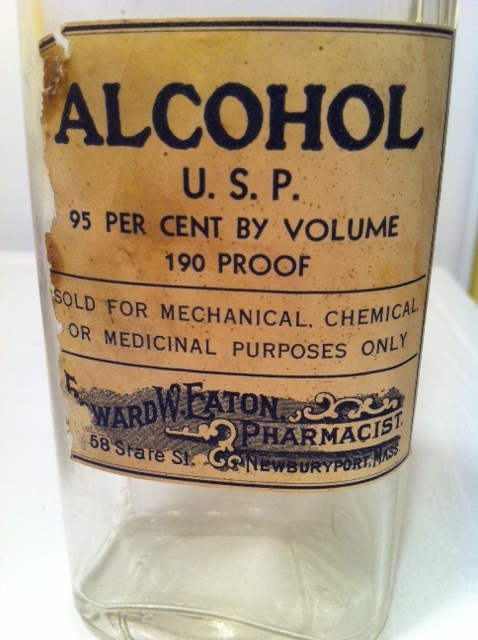 Bottle found in my basement from Edward W. Eaton, Pharmacist on 58 State Street. If anyone has an interest in collecting these sorts of things, let me know…. free. 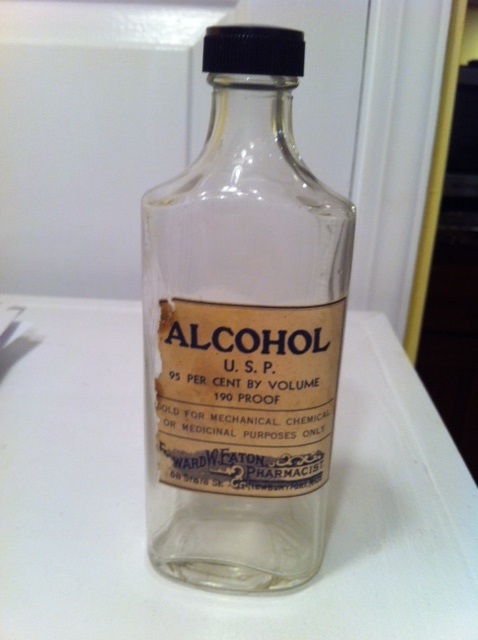 Hi John – this Edward F. Eaton bottle had to be around 1930 or so.